Red Buck offers an exceptional choice for anyone seeking a satisfying alternative to dull, flavorless pipe tobaccos. Red Buck is blended with the world’s finest tobacco, the Kentucky Burley leaf. Air cured at the right temperatures, with flavors and ingredients that are hard to match. The ultimate results, a satisfying smoke each and every time! 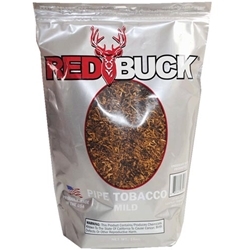 Say farewell to regular boring tobacco brands, and enjoy Red Buck Pipe Tobacco right here at Smokers Discounts!